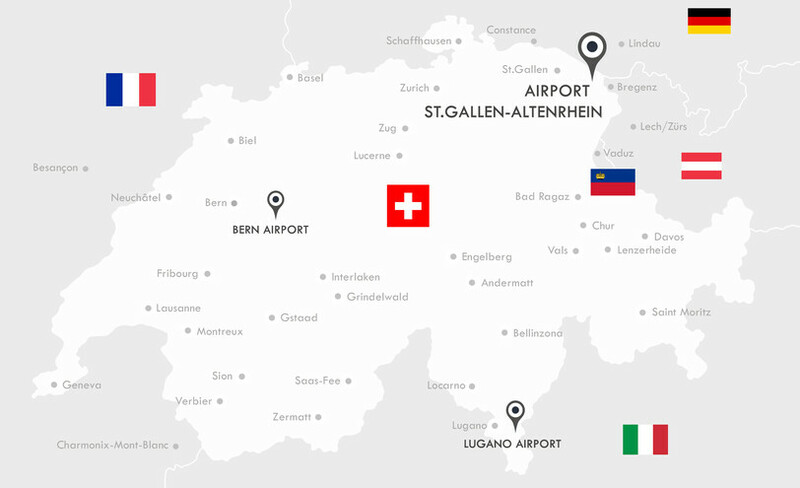 St.Gallen-Altenrhein, Lugano & Bern Airport - your clever alternatives for stress-free flights into Switzerland. St.Gallen-Altenrhein Airport, Bern Airport and Lugano Airport are clever alternatives for smooth and stress-free flights into Switzerland. Together they form the brand “Fly To Switzerland”. Offer your customers all benefits and advantages of leading Swiss regional airports: no slot restrictions, modern facilities with Schengen and non-Schengen immigration facilities, a familiar welcoming atmosphere, dedicated staff members and short distances that allow a start-up in less than five minutes. The Airport St.Gallen-Altenrhein is located in Eastern Switzerland directly at the Lake of Constance.